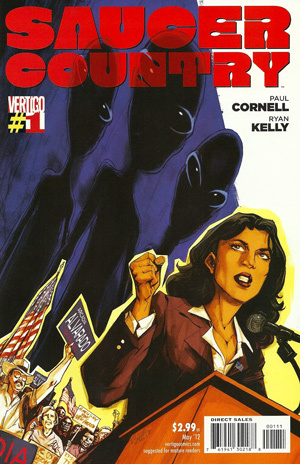 Saucer Country is a new comic book series written by Paul Cornell, drawn by Ryan Kelly and published by Vertigo. Arcadia Alvarado, the leading Democratic candidate for President of the United States, says she was “abducted by aliens.”As the Mexican-American Governor of New Mexico, she’s dealing with immigration, budget cuts and an alcoholic ex. She’s about to toss her hat into the ring as a candidate for President in the most volatile political climate ever. But then…a lonely road and a nightmarish encounter have left her with terrible, half-glimpsed memories… SAUCER COUNTRY is a dark thriller that blends UFO lore and alien abduction with political intrigue, all set in the hauntingly beautiful Southwest. To know a country, know its mythology. And this is the only modern American mythology. I should also take this opportunity to once again thank Mark Pilkington, whose fantastic book Mirage Men is one of the few sane works about UFO mythology. Mark is one of the major influences on Saucer Country. Shucks! I’ll hope to have a cameo appearance in a future issue! This entry was posted in Culture, Lore and tagged paul cornell, saucer country. Bookmark the permalink.